Salvation Army Red Kettle Campaign coordinator Connie Lang placed the first contribution, a check from former campaign coordinator Nancy Kyper, in a kettle at Walmart this morning as bell ringer Jimmie Kensinger, a volunteer with St. James Lutheran Church, looked on. The national Red Kettle Campaign kicked off Thursday. With two weeks of ringing bells already under their belt, county Salvation Army added Walmart to their list of site for the 2018 Red Kettle Campaign this morning, as the national campaign kicked off Thursday. Salvation Army Auxiliary Captain Charity Bender said she’s pleased with the campaign’s progress so far. Bender said even those who aren’t able to stand to ring bells are reaching out to help. Even with many folks stepping up to the plate, Bender said there are still bell-ringing slots available. Bender said the campaign lost only one day due to last week’s snowstorm. The Salvation Army hopes to raise $47,000 through this year’s campaign. The local campaign began Nov. 9, with bell ringing at Sandy Ridge Market in Orbisonia, Appleby’s Drug Store in Mount Union and Peebles in Smithfield Township. “Individuals, church groups, organizations, families, friends and neighbors can ring,” said first-year campaign coordinator Connie Lang. “The more volunteers we have, the more we can have the kettles out and the better we can serve those in need. Those interested in ringing bells can call the Salvation Army at 643-1430 to volunteer. The funds raised through the Red Kettle Campaign support the Salvation Army all year long. Bell ringing will continue Monday through Friday until Christmas Eve. Contributions to the campaign can also be made in Counter Kettles at businesses throughout the county or by mailing contributions to the Salvation Army at 2514 Shadyside Ave., Huntingdon. To make sure funds go to the kettle goal, please note “kettles” on the memo line of checks. Funds from this year’s campaign will also go to provide Christmas meals for county families in need. Bender said she’s still finalizing the number of families the Salvation Army needs to serve this holiday, as the application period ended earlier this week, but she noted they’re still in need of donations. Families that have applied for assistance will receive a turkey and trimmings, as well as toys and clothing received through the Treasures for Children campaign. Treasures for Children tags are on Christmas trees at Walmart and Peebles and folks have until Friday, Dec. 7, to pick up a tag. New, unwrapped items should be returned to either store by Monday, Dec. 10. Food and gifts will then be distributed to families from 9 a.m. to 2 p.m. Tuesday, Dec. 18, at the Salvation Army Church. As temperatures hovered in the low 20s this morning, Lang offered an extra thanks to those who volunteer despite the weather. The Salvation Army is a partner agency of the Huntingdon County United Way. Approximately 50 Huntingdon Area High School students took part in a “Turkey Trot” event Wednesday morning to raise funds for the Huntingdon Borough Police Department’s efforts to obtain a K-9 officer. Huntingdon Area High School seniors Draven Zook, left, and Andrew Finkle, right, presented a donation to Huntingdon Borough Police Officer Andy Young Wednesday as part of fundraising efforts to obtain a K-9 officer. A group of civic-minded Huntingdon Area High School (HAHS) students took part in a Turkey Trot event Wednesday morning to present members of the Huntingdon Borough Police Department (HPD) with a little something extra to be thankful for this Thanksgiving. Seniors Draven Zook and Andrew Finkle raised $275 by asking their classmates to pay $5 each to walk from the high school to Portstown Park, then on to the police station, where they made a donation toward the department’s effort to obtain a K-9 officer. The project was a joint effort as part of the high school’s JANUS program, soon to be renamed Kinnect, which is focused on providing project-based learning opportunities tailored to individual interests. The program focuses on the “4Cs,” communication, collaboration, critical thinking and creativity. As participants in the program, learners earn credits in science, mathematics, English language arts and social studies. Both young men have an interest in law enforcement and the military, so the idea of organizing an event to aid in the fundraising for HPD quickly took form. The walkers gathered in the Huntingdon Borough Council chambers, where Zook and Finkle shared information about the JANUS/Kinnect program and encouraged younger peers to take part as well. HPD Officer Andy Young, a 2008 graduate of HAHS, talked to the group about the progress of the efforts to obtain a K-9 officer as well as describing the type of work the new addition would complete. The department is pursuing a grant to cover the cost of a vehicle outfitted specifically for the dog, which will be utilized for drug detection and patrol work. It is hoped that the K-9 officer will join the ranks of HPD within the year. Members of the Huntingdon Lions Club delivered nearly 60 Thanksgiving meals to Meals on Wheels recipients and some of those working on the holiday Thursday. Lions Club member Howard Parlette, right, brought turkey dinners to Noah Yutzy, left, and Officer Adam McBride at the Huntingdon 911 Dispatch Center. Employee Leigh DeArmitt stocks jewelry items available for purchase in the Lincoln Caverns gift shop in Porter Township. Area business owners encourage folks to shop local this season to support the economy. Now that the holiday shopping season has officially begun, local merchants encourage people to shop in their own community to support small businesses and, in turn, the local economy. Shoppers will have the opportunity to do just that tomorrow, Saturday, Nov. 24, also known Small Business Saturday. At Lincoln Caverns, owner Ann Dunlavy said they are having their end-of-season sale, with 25 percent off all merchandise in the gift shop with purchases of $20 or more, which will be good through the end of the year. While folks may not think of Lincoln Caverns as a stop for holiday shopping, they offer unique gift items that can’t be found anywhere else. “We have rocks, fossils and crystals that last forever,” she said. “It’s not something that’s purchased today and gone tomorrow. We also have gift certificates for special events and other things. Dunlavy said people come from beyond Huntingdon County to find items at Lincoln Caverns. “There’s really nothing between Harrisburg and Pittsburgh that has the selection we do, so we have customers from all over the place,” she said. Carla Walker, owner of Walker’s Homestead Goods in Rockhill, said she’s planning something special for Small Business Saturday. Walker added items found at Walker’s Homestead Goods make great gifts and can’t be found anywhere else. Just a couple of blocks over at Grandad’s Workshop in Rockhill, owner Matthew Scott doesn’t have anything particular planned for Small Business Saturday, but he has one-of-a-kind gifts available for purchase. “I have a lot of Christmas décor, and we do refinished and refurbished furniture,” he said. Scott said supporting small businesses for Small Business Saturday, or any other time of year, not only helps him as a business owner, but helps those who create the items for purchase. While many stop at Cassville Country Store to pick up grocery items or enjoy a quick bite to eat, many may take advantage of the other items that can be purchased as gifts there. Whitsel said when she and her husband, Mark, opened the store 10 years ago, she felt it was important to “live here, work here and play here,” as much as possible. “It’s like a circle, and it starts small, and then it spreads,” she said. “I employ 15 local people, and they all live here, work here and play here, so if they support me, I can support them, and we can support the county. Huntingdon Area School District staff, parents, learners and residents have one week left to take part in the district’s annual climate survey. According to superintendent Fred Foster, the surviey is part of the School Climate Leadership Initiative that is being facilitated by Tuscarora Intermediate Unit (TIU) 11. “The climate survey is available for staff, learners, parents and community members,” said Foster, who noted the survey is confidential and anonymous and is distributed by the Office for Safe Schools. Foster said it takes approximately 15 to 20 minutes to complete the survey that seeks input about the climate and atmosphere of the district. Some topics addressed include communication between the community and district, treatment of learners and others. Foster said there are four primary constructs of the survey, including safe and respectful school climate, high expectations and academic rigor, learner support and peer social and emotional learning. “The more people who complete the survey the more accurate our results will be,” he said, noting the data will help identify accomplishments and areas of concern within the district. Huntingdon Area High School assistant principal Nick Payne elaborated on Foster’s comments. Payne provided further insight into the survey. According to last year’s school climate survey results, the district received a positive overall average school climate score of three. Out of those surveyed, 54.6 percent stated they felt their child’s school is a supportive and inviting place for students, while 52.5 percent of participants siad the district doesn’t welcome input from community members. In relation to last year’s data, Payne hopes more people will participate in the survey to help produce more accurate results. Parents who wish to complete the survey should visit www.huntsd.org, click on Climate Survey and use the invitation code 6UDSDH. Community members who wish to complete the survey should follow the same steps but use the invitation code RIPW5J. This year’s bear rifle season, which wrapped up Wednesday, was not only one of the highest harvests recorded for opening day in the county, but also saw two record-breaking bears harvested in the state. The harvest reported during the 2017 bear rifle season was one of the lowest on record within the state. Within the Game Commission’s southcentral region, which saw 247 bears harvested, Huntingdon County reported the highest number of bears harvested at 77, with Bedford County at 51, Fulton County at 33 and Blair County at 21. The Huntingdon County bear check station at the Army National Guard Readiness Center in Smithfield Township weighed in 87 bears Saturday, six Sunday, 18 Monday, 10 Tuesday and one Wednesday. 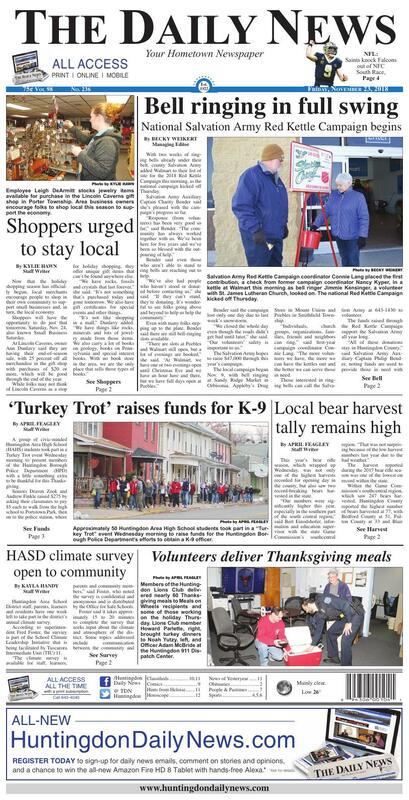 Huntingdon County had the second-highest harvest numbers in the state for the first day of the season and bears were harvested in 54 counties total. A total of 13 bears checked in Huntingdon County had been tagged for research or because they had been relocated due to nuisance problems. The top 10 bears processed at check stations by the final day of the season were either estimated or confirmed to have live weights of 600 pounds or more. Previously, the state’s largest harvested bear weighed 704 pounds. That bruin was topped by a 780-pound male taken Nov. 19 by Michael J. Rubeo of Mercer, in Howe Township, Forest County, and a 708-pound male was taken by Timothy J. Weaver of Dallas, Pennsylvania, Nov. 20, in Harvey’s Lake Borough, Luzerne County. Other large bears taken this season’s first two days include a 704-pound male in Goshen Township, Clearfield County; a 697-pound male taken in Chapman Township, Clinton County; a 681-pounder taken Coal Township, Northumberland County; a 680-pounder taken in Chest Township, Clearfield County; a 679-pound male taken in Farmington Township, Warren County; a 666-pound male taken in Snyder Township, Jefferson County; a 627-pound male taken in Snyder Township, Jefferson County; and a 623-pound male taken in Newport Township, Luzerne County.